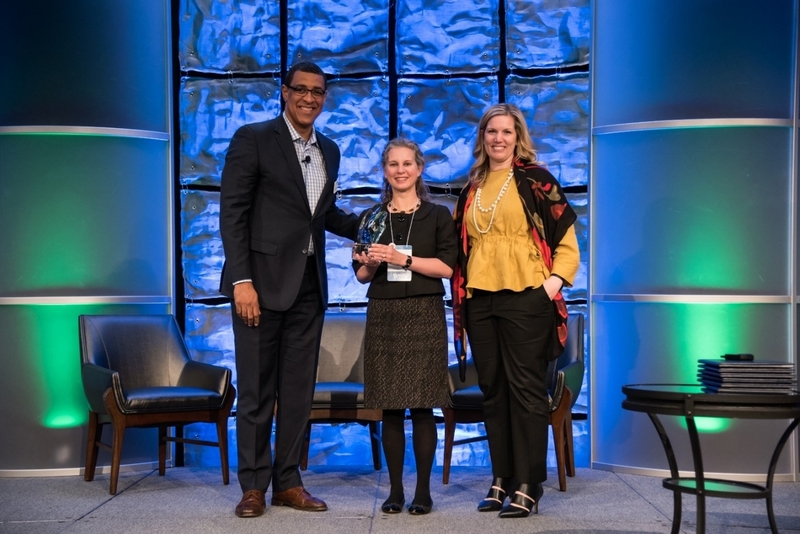 ORLANDO, Fla., April 16, 2018 /3BL Media/ – ACCP granted Laura K. Gallagher, Global Head, Corporate Citizenship, AIG the 2018 ACCP Ignite Award for her exceptional leadership in the corporate citizenship field. Ms. Gallagher was recognized for her dedication to AIG and her commitment to creating positive impact on environmental, social, end economic outcomes in AIG’s local community and around the world. Ms. Gallagher’s work at AIG has included highly successful partnerships with global organizations, such as Enactus and Junior Achievement, on initiatives that leverage AIG employee expertise and business knowledge to meet community needs. One of her many successful initiatives, with the help of AIG’s food services team, took an underutilized office coffee shop in partnership with local vendors to generate business and raise funds for a local homeless organization. Ms. Gallagher developed the current strategy of corporate giving – moving from a completely decentralized model to one focused on Safety, Security, and Disaster Preparedness and Relief. These themes are strongly aligned with the insurance business, support AIG’s mission to create a better tomorrow, and are exemplified through the Volunteer Time Off and Matching Grants Programs that Laura formalized at AIG. Ms. Gallagher has been instrumental in driving the success of AIG’s Winter Summit, a signature business event that serves as a fundraising platform for Disabled Sports USA, an organization with the mission to provide national leadership and opportunities for individuals with disabilities to develop independence, confidence, and fitness through participation in community sports, recreation, and educational programs. Over the past 10 years, AIG’s Winter Summit has resulted in millions of dollars raised to help serve over 10,000 wounded warriors and their families, offering hundreds of events in over 30 sports across the country. Ms. Gallagher was recently honored as one of NY City & State’s 2017 Responsible 100. She is also credited with AIG’s 2017 Kemper Lesnick award for Corporate Social Responsibility, which highlighted the company’s support of financial education and workforce readiness through its partnership with Junior Achievement. The Kemper Lesnick recognition was designated by the Insurance Business Awards America as an acknowledgement of the "brightest and best" in the insurance industry. The Ignite Impact award is the highest award bestowed on an individual by ACCP. It recognizes an individual’s contribution in the field of corporate responsibility leading to community and business impact. Founded in 2005, ACCP is the sole membership-based organization chartered to champion the Corporate Philanthropy professional. ACCP connects members to information, peers and resources and cultivates educational opportunities that promote better stewardship of corporate philanthropic resources thereby magnifying social and business impacts. For more information on Ignite Impact or ACCP, please email Maryann Fiala at maryann@accprof.org or visit www.accprof.org.